Cold weather is creeping in!! Time to get those cozy sweaters and winter boots ready. While you’re at it, you may just want to whip up a batch of these Apple and Rooibos Tea Throat Lozenges to have on hand too! With the weather getting cooler in LA over the last few weeks I’ve noticed that a little itchy throat has come along with it. It happens to me every single year when fall starts creeping into winter. Cupfuls of hot tea and spoonfuls of honey is how I combat a scratchy throat at home, but when I head out in the world I tend to stuff my pockets full of store bought throat lozenges to keep my scratchy throat at bay. I don’t really mind sipping on mug after mug of hot tea with honey, I actually kind of like that part. It’s the whole store bought lozenge thing that freaks me out! I mean one or two every now and then no big deal, but I was knocking back at least 2 a day last winter. That can’t be a good thing right!? 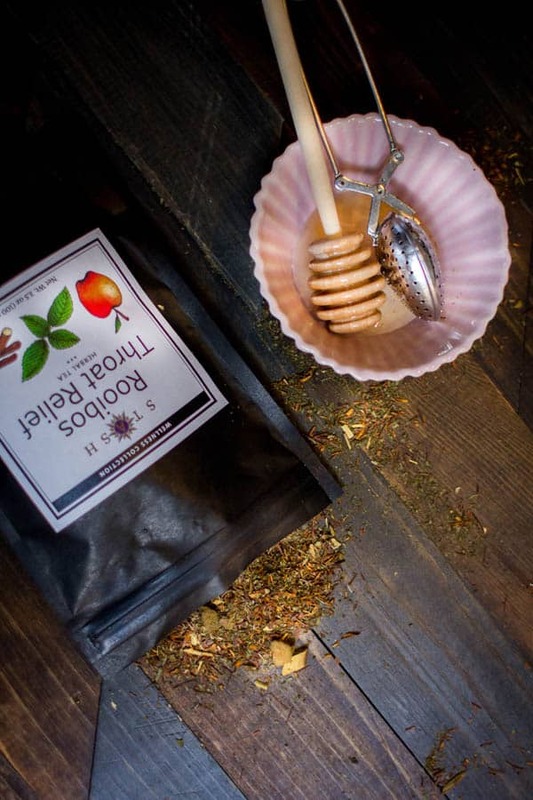 Earlier this fall when I was perusing the Stash Tea website to stock up on some of my favorite teas I noticed their Rooibos Throat Relief Tea. Their special blend combines rooibos tea, licorice root, peppermint, and tulsi (AKA: holy basil) and is specially formulated to help soothe scratchy throats. I couldn’t resist ordering a bag to have in my pantry for the winter months ahead. Naturally, once the tea arrived in the mail curiosity got the better of me and I had to brew up a batch. The tea itself is beautifully sweet and slightly fruity with a twist of mint at the finish, just what a scratchy throat needs! At first sip, I knew I had to find a way to take this tea with me all season long. After quite a bit of sipping on that tea, I decided to do something I had thought about for quite some time…I decided to make homemade rooibos tea throat lozenges! I scoured the internet, read about a trillion articles and recipes and finally came across Foodie with Family’s homemade throat lozenge recipe. Rebecca’s 11 in depth tips in her Cook’s Notes were so thorough and helpful, I highly suggest checking her recipe out too before you make your first batch. The process of making homemade throat lozenges is a lot like making candy. You’ll need a few special pieces of equipment like a large nut milk bag for straining the loose leaf tea( a fine mesh metal strainer will work too. 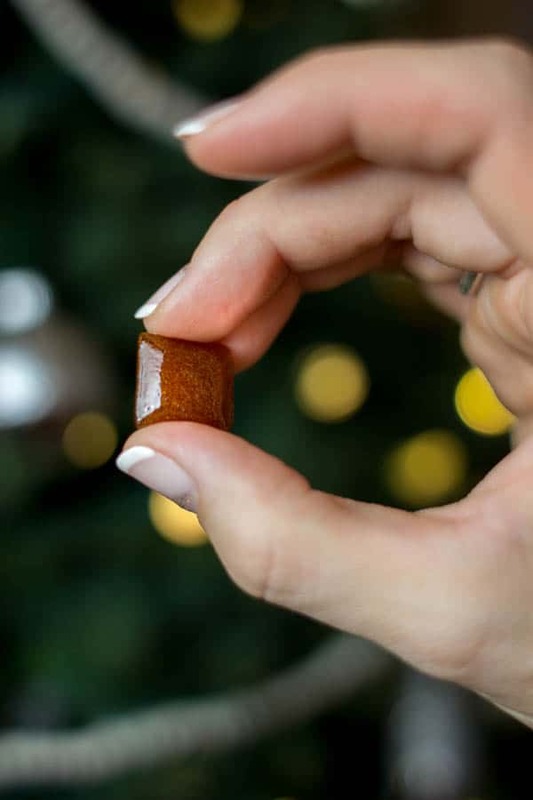 ), a deep pot, a candy thermometer, a heat-proof silicone spatula, silicone candy molds or hard candy molds , a handful of ingredients and about a half hour of your time to make a homemade batch of throat lozenges, but the final product is totally worth it! Honestly, the whole process of making the lozenges feels a bit therapeutic itself. I listened to my favorite records while I watched the sugar & honey mixture bubble and fizz its way to the right temperature. No to mention the aroma that wafts its way out of that pot smells absolutely intoxicating!!! I’ve made a couple batches of these throat lozenges now to have on hand for the cold weeks to come and even made a dozen lollipops for Kash since I’m not comfortable with him eating small pieces of hard candy. He couldn’t resist trying one as soon as I popped them out of the molds and guess what, my picky little dude actually liked it!!! The best way to store these beauties is in a single layer on wax paper. I’m storing our lozenges in an empty mint tin, but since the lollipops are too big for that I wrapped them individually in plastic wrap before storing them in our pantry where it’s nice and cool. Now we’re all set for scratchy throat season with no need to buy an oversized bag of throat lozenges from Costco now I have a homemade version that I don’t mind my kids using too! Save the extra tea concentrate covered in an airtight container in the fridge for up to a week or you can freeze the concentrate in ice cube molds and defrost before your next batch of throat lozenges. 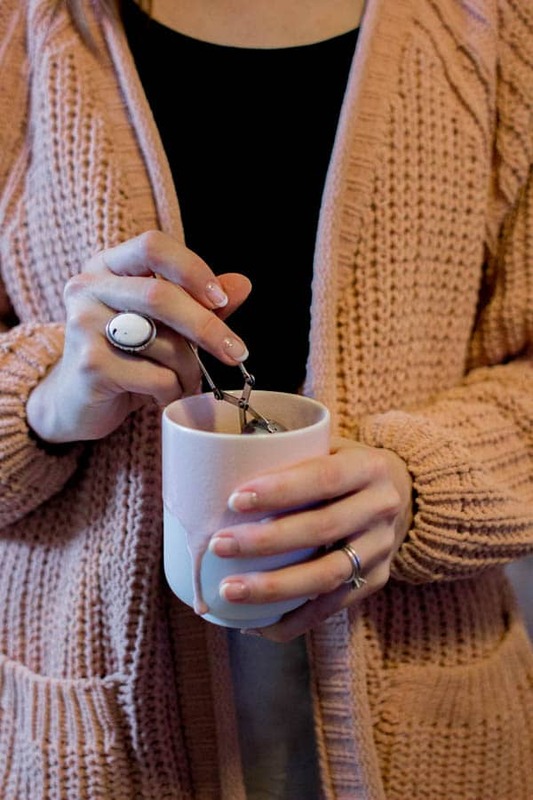 Combine the loose leaf Stash Rooibos Throat Relief Tea, chopped apple and ginger in a nut milk bag if using or directly into a small saucepan. Cover with 4 cups boiling water and let steep for 10 minutes. Strain well by either removing the nut milk bag from the tea and squeezing out any excess liquid or straining the tea through a fine mesh strainer lined with cheesecloth. In a large, heavy-bottomed pot over medium- high heat combine the Rooibos Throat Relief tea concentrate, sugar, and honey. Clip a candy thermometer to the side of the pot and stir the mixture until the sugar is completely dissolved. Bring the sugar syrup to a boil, stirring frequently. When you stir be sure to gently scrape up the entire surface of the bottom of the pan but be careful to avoid the sides of the pot where sugar crystals are forming. (The crystals from the side of the pot if reincorporated into the sugar mixture could make your final product brittle.) Keep a close eye on the thermometer and when the mixture reaches 250°F begin to stir constantly until the mixture reaches the hard crack stage ( 302°F). Carefully transfer the hot sugar syrup to a pyrex measuring cup with a pour spout. 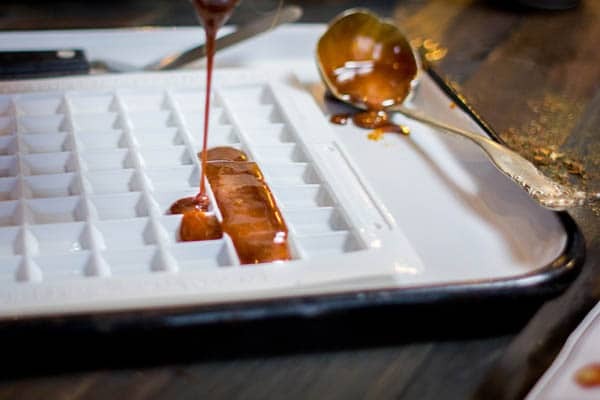 Then carefully, but quickly pour the syrup into the prepared molds. Before the mixture begins to harden gently use your silicone spatula to coax the sugar syrup that has pooled on top down into the molds and smooth the top, removing any excess syrup. Allow to harden for 3-4 hours or overnight. If making popsicles you will need to place the popsicle sticks into the molds before the mixture hardens. If making lozenges you will notice that each individual indentation in the molds that I suggest using makes 1/2 of 1 regular sized lozenge. Simply place that flat side of two halves together and they will fuse themselves together immediately. Store in a single layer on wax paper in an air-tight container. These lozenges will keep for up to a few months, but because of the honey they may soften over time. They are still perfectly fine to eat after they have softened.